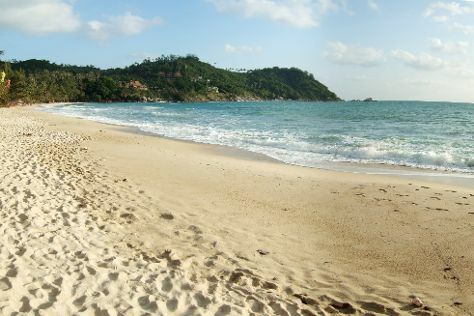 On the 8th (Mon), enjoy the sand and surf at Patong Beach, then stop by Alex Fashion House, then take in the spiritual surroundings of Chaithararam Temple (Wat Chalong), and finally get great views at Nai Harn Beach. To find other places to visit, photos, and more tourist information, read Karon trip itinerary builder app . Dammam, Saudi Arabia to Karon is an approximately 17-hour flight. Traveling from Dammam to Karon, you'll lose 4 hours due to the time zone difference. Expect colder weather when traveling from Dammam in July: highs in Karon hover around 36°C, while lows dip to 28°C. Finish your sightseeing early on the 8th (Mon) to allow enough time to travel to Bophut. Start off your visit on the 9th (Tue): contemplate in the serene atmosphere at Wat Plai Laem, then stop by Classic International Suits, and then get a new perspective on things with Boat Tours & Water Sports. For ratings, where to stay, traveler tips, and tourist information, read our Bophut trip itinerary website . Getting from Karon to Bophut by combination of taxi and flight takes about 2 hours. Other options: do a combination of bus and ferry; or take a bus. Expect a daytime high around 38°C in July, and nighttime lows around 31°C. Finish your sightseeing early on the 9th (Tue) to allow enough time to ride a ferry to Ko Pha Ngan. Start off your visit on the 10th (Wed): kick back and relax at Thong Nai Pan Noi, enjoy the sand and surf at Bottle Beach, and then explore the striking landscape of Thansadej Koh Phangan National Park. 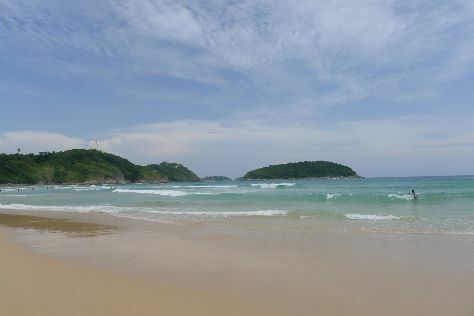 On the 11th (Thu), you'll have a packed day of sightseeing: see some colorful creatures with a scuba or snorkeling tour, take in the spiritual surroundings of Chao Mae Kuan Im Shrine, and then enjoy the sand and surf at Salad Beach. To find photos, other places to visit, and tourist information, read Ko Pha Ngan online route planner . Ko Pha Ngan is just a short distance from Bophut. In July, daytime highs in Ko Pha Ngan are 38°C, while nighttime lows are 31°C. Finish your sightseeing early on the 11th (Thu) so you can travel to Bangkok. 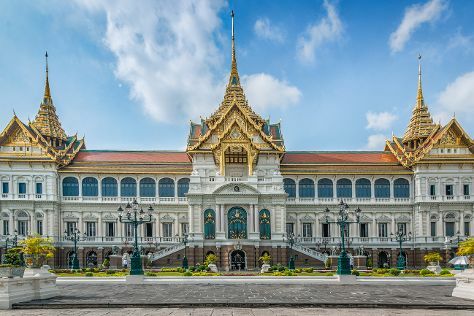 Kick off your visit on the 12th (Fri): explore the historical opulence of The Grand Palace, don't miss a visit to Wat Pho, then take in the spiritual surroundings of Temple of Dawn (Wat Arun), and finally contemplate in the serene atmosphere at Wat Saket. Here are some ideas for day two: browse the eclectic array of goods at Chatuchak Weekend Market. To see reviews, ratings, and tourist information, refer to the Bangkok trip planning website . You can do a combination of bus and flight from Ko Pha Ngan to Bangkok in 5 hours. Other options are to take a bus; or do a combination of ferry and train. In July, plan for daily highs up to 39°C, and evening lows to 30°C. On the 13th (Sat), wrap the sightseeing up by early afternoon so you can travel back home.